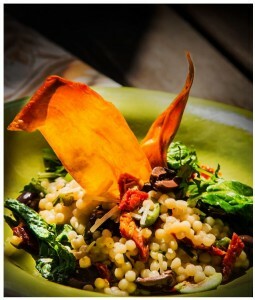 This recipe uses a kind of cous cous known as Israeli cous cous. It’s really just a small pearl pasta and is widely available. It is made from the same toasted semolina as the regular granular Moroccan cous cous with which we are most familiar but the size is larger and round, about the size of whole peppercorns. The great thing about Israeli cous cous is that you can make a risotto in half the time of a rice-based version. Additionally cous cous is a little more “forgiving” in that it doesn’t completely mush out as it sits! Garnish: Fried sweet potato chips or basil sprigs if desired. Sauté the shallots and garlic in olive oil until lightly colored. Add the cous cous and sauté for a minute or two longer. Add the wine and 1/2 cup of the stock and stir occasionally until liquid is nearly absorbed. Add remaining stock in half-cup increments and continue to cook and stir until stock is nearly absorbed. Continue in this manner until the cous cous is tender but still has some texture (about 10 minutes total). Stir the olives, kale, tomatoes, zest, chives and cheese into the risotto. Serve immediately in warm bowls garnished as you like.